Woo-hoo! We made it to the end of the week! And there are sticky buns!! Just in time for lazy weekend breakfasts! And these are not just any sticky buns but baked straight from the pages of the awesome, almost encyclopedic, The Food Lab: Better Home Cooking Through Science by J. Kenzi Lopez-Alt, also the author of the hit food blog, Serious Eats. If understanding more about the "why" in the kitchen matters to you, you are going to love this edition of Famous Fridays...you're also going to love these sticky buns--just look at all that luscious gooeyness!! Not really being much of a science person (I took astronomy in college to learn cool stuff about planets and stars never dreaming it would mostly be physics and math-yikes!) I didn't really expect to like this cookbook, with its focus on the science behind the cooking, as much as I did, but I have to admit that working my way through it I have learned an awful lot, between all the great recipes, scientific explanations and color photos. I've also laughed a lot which I didn't expect to do considering it's (gulp) "science". The recipes, and there are tons of them in this almost-1,000 page tome are mainly forAmerican classics like the best penne vodka, pancakes, roast chicken, steak fajitas, banana bread...it goes on and on. In fact, my only real criticism of the book is that it's a bit overwhelming. I struggled a lot with what I want to share with you, but in the end how could I not take up the gauntlet and see if these were indeed the world's most awesticky buns? It was just too tempting! First off, you make an easy buttermilk, yeast dough. And while it's rising, you make the sinfully addictive pecan-caramel sauce. Once it's risen, you roll it out into a long rectangle. Then you brush the whole thing with melted butter (I did warn you about the not low-cal part) and sprinkle with a cinnamon/brown sugar mixture. Which you then place on top of the sauce in the baking dish and stick in the fridge to finish rising overnight. 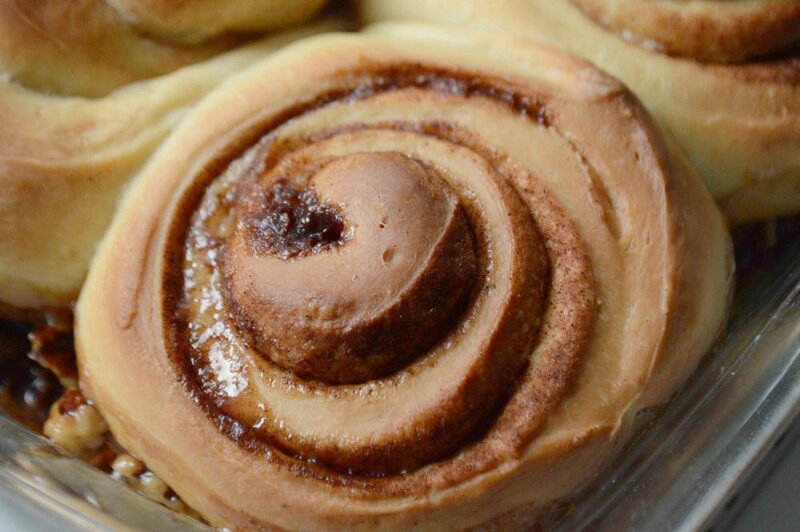 Now, you get some shut-eye, dream happy, sweet dreams (sticky bun sweet, if you know what I mean) and in the morning, take the rolls out of the oven and bake. They will bow down to you, I swear!! Now, not having tasted all the sticky buns in the world (yet) I can't speak with 100% accuracy but in my world to date these are the most awesome sticky buns I've ever had and I hope you will think so too!! Try them and let me know. And pick up a copy of The Food Lab (careful, it weighs almost 7 pounds!!) and start having more success making your favorite foods (hint, hint--this book would make a great holiday gift for that cook in your life, especially one who's just starting out!). Meanwhile, have a great and as always, delicious weekend and I'll be back next week as we impossibly head into the end of October?!! Be safe! 1. To make the dough: Whisk the eggs in a large bowl well. Add the sugar, buttermilk, salt, yeast and melted butter and whisk until well mixed--it may be clumpy but this is OK. Now use a wooden spoon to mix in the flour until there is a well-formed ball of dough. Turn the dough out onto a lightly floured board or countertop and knead for about 2 minutes, until the dough is smooth and silky. Place the dough back in the bowl, cover with plastic wrap and leave at room temperature for about 2 hours, until roughly doubled in volume. 2. Meanwhile make the pecan-caramel sauce: Place the butter and brown sugar in a small saucepan over medium-high heat, stirring every now and then, until sugar is totally dissolved and the mixture is bubbling. This should take about 2 minutes. 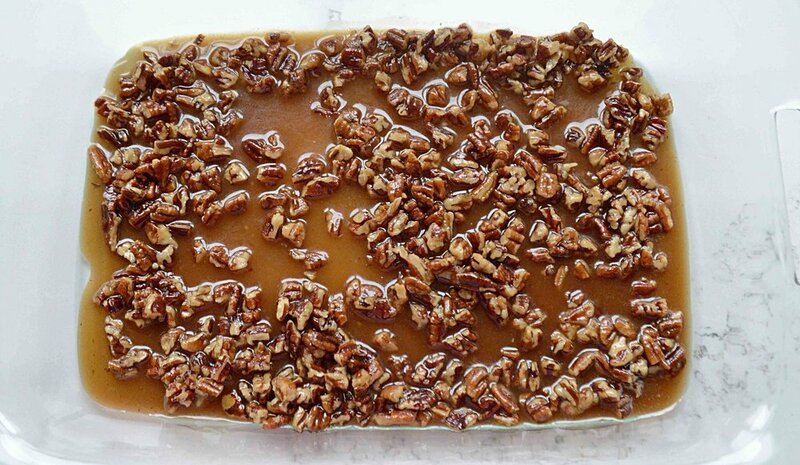 Add in the buttermilk, pecans and salt and mix well and pour into a 9x13-inch glass baking dish. Set aside. 3. To make the filling: Mix the sugar and cinnamon together in a small bowl and set aside. 4. Once the dough has risen, turn out onto a floured surface and lightly sprinkle flour on top of it as well. 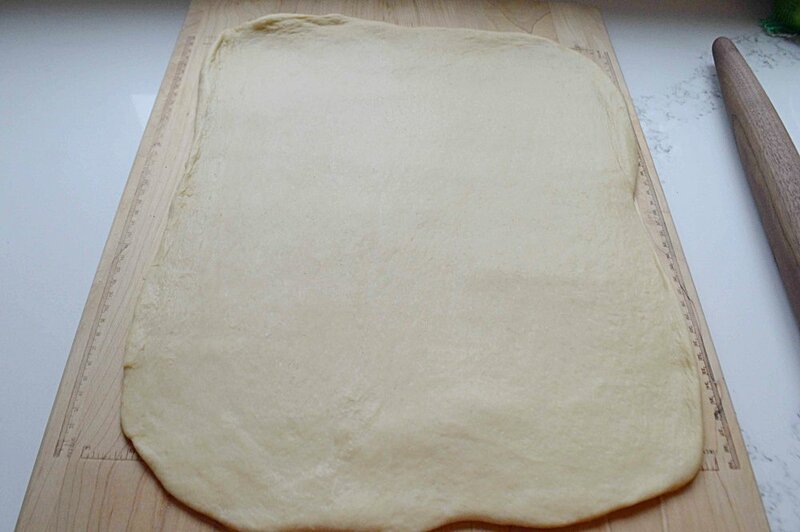 Push the dough into a rough rectangle with your hands and then use a rolling pin to roll it into a 16 x12-inch rectangle with the short end facing you. 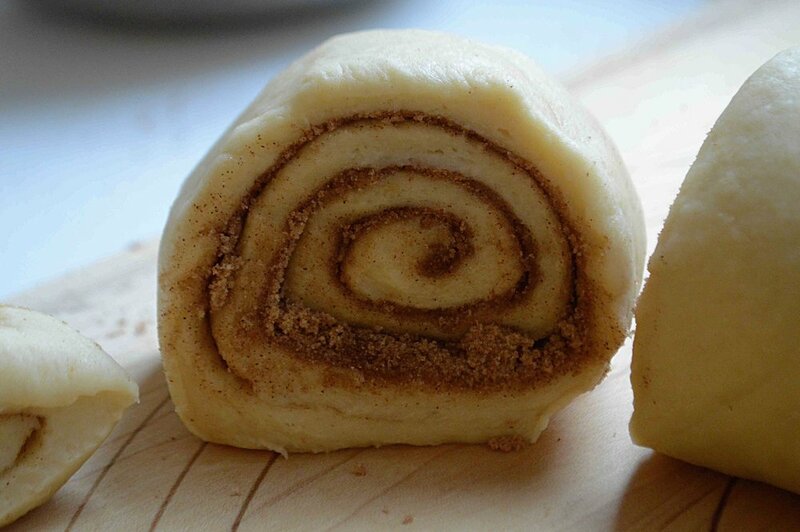 Use a pastry brush to brush the melted butter all over the dough, leaving about a 1-inch border along the top edge. 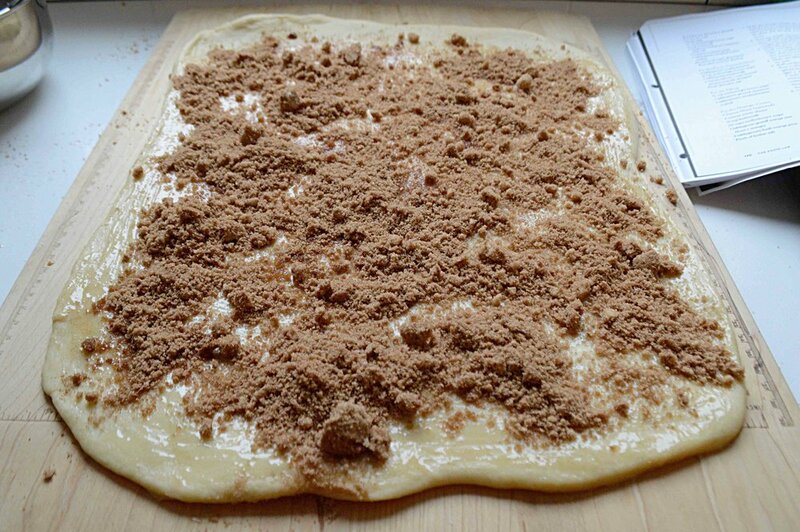 Sprinkle the cinnamon sugar mixture all over the dough and use your hands to push it into the butter a bit and make sure it's spread evenly. Roll the dough up jelly-roll-style into a tight cylinder, using a bench scraper to help release the dough from the surface and allow you to make the roll tight. Pinch the seam shut and turn the dough so that it's seam side down. If you need to even out the shape a bit. 5. Use a sharp knife to cut the roll into 12 even slices. The easiest way to do this is to cut the log in half and then cut each half in half, and then cut those into thirds. Place each roll on top of the sauce in the dish with the swirl side facing up, nestling the rolls together. Make sure the end slices go cut side down. Cover with plastic wrap and either leave at room temperature for about 2 hours until doubled in volume, the rolls should be well puffed and pressed tightly against each other or place in the fridge overnight to proof for up to 12 hours. 5. In either case, before baking, preheat oven to 350ºF. If rolls have chilled overnight, take them out of the fridge when you start the oven so that they can warm up a bit. Bake for about 30 minutes until buns are golden brown and well puffed, turning the dish halfway through the baking process so that they cook evenly. Let the buns rest for about 5 minutes, then invert the buns onto plates and scrape out excess sauce and nuts and spoon over the buns. Serve immediately. 6. Leftovers can be refrigerated and popped into the microwave for a quick reheat. Note: Recipe adapted from The Food Lab Cookbook by J. Kenji Lopez-Alt. There is an Orange-Cream Cheese glaze that is optional in the book and these definitely don't need anymore. But if you really want to mix 4 ounces cream cheese, 1/4 cup buttermilk, 1 1/2 cups confectioners' sugar, 1 tablespoons freshly grated orange zest, 2 tablespoons fresh orange juice and a pinch of kosher salt in a small saucepan and cook over medium heat, whisking constantly until the mixture is simmering and homogeneous. Spoon over the cooked buns and serve.